Hello Aspirants, looking Types of Entries in Indian Coast Guard as Officer. Great! So if you have a dream you should know the way to achieve your dreams and how to get their. We would help you to know all the different types of entries in Indian coast guard according to your Education qualification and age. 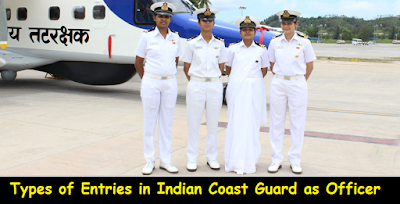 There are number of ways you can join Indian coast guard like general duty, pilot, technical and law branch. For more details kindly checkout the article below and also know the physical standards required for the coastal guard entry. Aspirants need to be aware of the entries to which they are eligible.So kindly know them and for more details kindly check official website of Indian coast guard below. For any questions regarding Types of Entries in Indian Coast Guard as Officer kindly comment below. The single most important factor today for the Coast Guard today, are the Officers and Men who ultimately meet the challenges at sea. You could be just the man for this challenging sea- going career if you are intelligent and bold and can think with originality and possess leadership qualities. Service in Coast Guard is not merely an employment. It is where you play the most important role of protecting the nation's interests. The life of a Coast Guard officer is a happy mix of many things; hard work, professionalism, risk and adventure and the opportunity to move around and visit different places within India and abroad. Physical Standard: Height Min 162.5 cms Max 197 cm, Leg Length Min 99 cms, Weight Proportionate to Height, Eye sight 6/6 without glasses. (i) Asst Commandant (GD) and Technical: 157 cms minimum may be reduced by 5 cms in the case of Assamese (including those from Nagaland, Mizoram, Meghalaya, Arunachal Pradesh, Manipur and Tripura) Garhwal, Sikkim, Local tribes of A & N Islands and 2 cms in case of candidates from Lakshadweep, mainland settlers in Andaman and Nicobar. (ii) Asst Commandant GD (Women) : 152 cms. (iii) Asst Commandant (Pilot) (Men/Women): Minimum 162.5 cms and maximum 197 cms, leg length minimum 99 cms and maximum 120.0 cms. (b) Weight : Proportionate to the Height and Age, + 10 % acceptable.